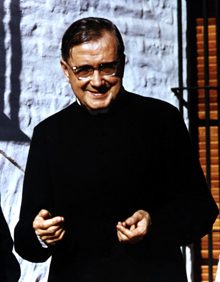 On Friday, June 7, 1974, St Josemaria arrived at the airport of Ezeiza, in Argentina, from Brazil. It was a clear, cool, sunny day, the wind having blown away the clouds of the day before. En route to La Chacra, the conference center where he would be residing during his stay in Argentina, the Father asked about everything that attracted his attention. He asked the people in the car for information and specific details, building up a mental image of the country and its people. 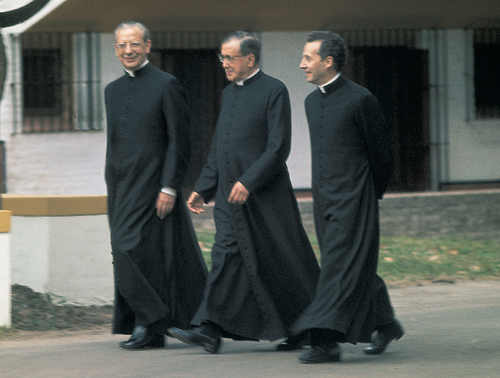 The Founder of Opus Dei spent three weeks at La Chacra: June 7 – 28. To that conference center, which was on the grounds of an old estate near Buenos Aires, came hundreds of his daughters and sons. Every day, several times, the living room was filled up, with members of Opus Dei, Cooperators and friends, priests and laity. At those get-togethers were people of all ages and walks of life: the young and the not so young, fathers and mothers… They came not only from other cities of Argentina, but also from Uruguay and Paraguay. On Wednesday, June 12, he made a pilgrimage to the shrine of Our Lady of Lujan, Patroness of Argentina. The Father looked upon the get-togethers at La Chacra as a gift from heaven. 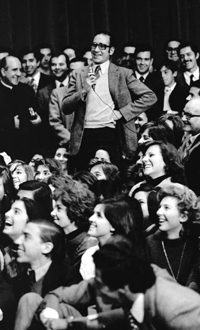 He was transmitting the spirit of Opus Dei to those children of his. Meanwhile, plans were being made for some huge get-togethers, not only for Opus Dei members and their families and friends, but also many people who knew little about the Work. Finding suitable places for these get-togethers was not easy. But they did, almost miraculously, get two dates at the General San Martin Conference Center: June 15 and 16. And for the eighteenth and the nineteenth, which were workdays, they were able to reserve the auditorium of the Colegio de Escribanos, which was centrally located and had good facilities. Another place they decided to rent was the Coliseum Theater. Someone with experience in such things said to them, “Ask for it if you like – maybe you can get it – but you won’t fill it.” They were able to get it for two days (the twenty-third and the twenty-sixth), and on each of those days it was packed beyond capacity, with five thousand people. Happily, the cameras were rolling. There remains a splendid collection of documentary films of the Father’s catechesis in Latin America, starting with some of the get-togethers in Brazil. The Father usually opened with a friendly greeting or a brief religious commentary. It was the prelude to a conversation. Right away the questions started coming. Several microphones had been set up, together with a system of red lights to indicate where the people were who wanted to speak. Interruptions were allowed, although the person with the microphone had precedence. This made the Father a target of opportunity. He could not evade the questions; he answered them as God gave him to understand that he should; and it was obvious that the Holy Spirit was breathing on him, because his words left peace and joy in the souls of those who brought him their problems. Ordinarily the discussions had to do with family and the education of children, spiritual life, clarity of ideas in the midst of doctrinal confusion, the work of apostolate, confession… But in the general get-togethers the questions were more varied, and the personal stories not always so rosy. From time to time, from amid that sea of people, there would be heard a voice crying out for help. On Sunday, June 23, in the Coliseum Theater, a woman managed to get hold of one of the microphones. She had just lost a son. She belonged to the Work and wanted the Father to explain to everyone the peace and joy with which suffering is borne in Opus Dei. The Father told them that God is not a tyrant, and that neither does he behave like a hunter, lying in wait to fire a deadly shot at his target. God, he said, takes our loved ones so that they can bask in his glory and his love. He went on consoling the woman, but when he saw that everyone was getting carried away by the emotion of it all, he sought another question. A red bulb lit up at the back of the theatre, and there was heard the voice of an elderly lady, who was trying to read from a sheet of paper, but was not succeeding. The Father responded, “Daughter, yes; love him more. Love your son a lot. Maybe it’s that we don’t pray enough. You do pray a lot; I will pray more. Those of us who pray are few, and we pray little. And we have to pray a lot for priests, for all priests! Your son will make it; he will be a great apostle. Pray, ask. You have already been heard, but the Lord wants you to pray more. My prayer will be joined to yours. And I am sure that the hearts of these people, of all these people from up there on top to the last seat, are moved with the same desire to ask of the Lord that your son will be a saint. And he will be. The Father did not forget that promise of prayers. On the trip back to La Chacra he became quieter than usual. It was obvious that he was praying, and from time to time he turned to Father Emilio (the Counsellor) and said that he should try to help that priest who was not doing well. It could be clearly seen how this hurt the Father. Extracts from Andres Vazquez de Prada, The Founder of Opus Dei, vol. III The Divine Ways on Earth, Scepter, 2005, pp. 501 – 508.